With the booming of Indian populace in the United States from 12,000 in 1960 to 4 million in 2018, Indian food has undergone a series of twists and tweaks to suit the American palate. Such amazing culinary mush-ups as lassi flavored with winter squash, yogurt marinated fried chicken, chicken wings in chickpea crust, dosa wrapped around apple wood-smoked bacon and topped with fried chutneys, jiggery-glazed apple pie, gulab jamun cheesecake, and kulcha flatbreads with pastrami have resulted from Indian American chefs’ ceaseless experimentation with fresh spins on traditional recipes they grew up with in India. This is the theme of Indian American celebrity Chef Maneet Chauhan’s latest cooking show on TV Asia, a popular channel for the Indian community in North America. Premiered on January 9, 2019, TV Asia’s ‘Festive Cooking with Maneet’ is a 10-month-long program. A James Beard Award of Excellence winner, Chef Maneet Chauhan from New York will be unraveling how some of the most traditional South Asian festive dishes rhyme with American taste buds, on the show. The “Festive Cooking with Maneet” show on TV Asia will walk viewers through the changing world of South Indian cooking to show how the South Asian communities have adapted to the ways of life in America over the decades. Sankranti, Holi, Baisakhi, Eid, Navratri, Diwali and the Fourth of July are some of the popular occasions, the culinary significance of which will be covered on the show. 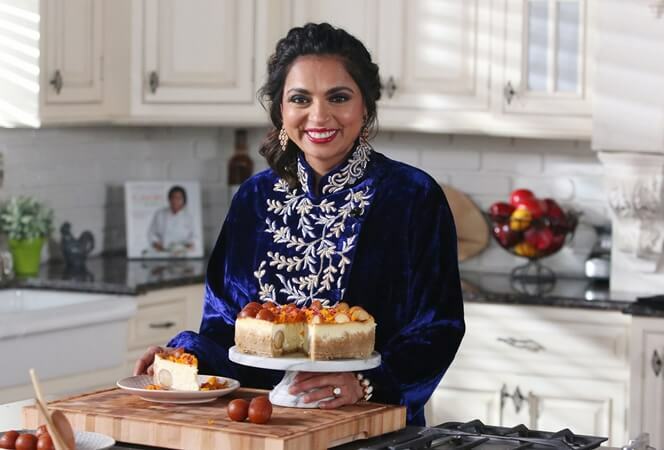 In addition, Chef Maneet Chauhan herself will be seen recreating some of her favorite Indian recipes and celebrating her umbilical connection with them on the show. Born in Ludhiana, Punjab, Maneet Chauhan is a versatile chef, a celebrated cookbook author, an eminent TV personality and an active philanthropist. Her journey from India to USA, from Manipal’s Welcome Group Graduate School of Hotel Administration to the Culinary Institute of America, from an executive chef to an entrepreneur, from the panel of judges for the Food Network’s show ‘Chopped’ to the Obamas’ Annual Easter Egg Roll Hunt at the White House is truly an inspirational one. After a short stint as an apprentice chef with leading 5-star hospitality groups like the Taj in India, Chef Maneet Chauhan shifted to New Jersey where she joined a startup restaurant in Cherry Hill and helmed the restaurant’s expansion from 70 seats to 140 seats. When she was 27, she was appointed the opening executive chef for a team of 40 male chefs at Vermillion restaurant in Chicago. The way she helmed the restaurant’ kitchens and the execution of the Indian-Latin cuisine earned Vermillion multiple accolades and awards, including Wine Enthusiast’s Best New Restaurant in the US, and Chicago Magazine’s Best New Restaurant. Indian American Chef Maneet Chauhan gave her best at Vermillion restaurant in New York City too. It was then that Time Out Magazine nominated her as the ‘Best Import to New York.’ Singapore is her favorite food city for offering a perfect balance of delicious street food from India, Thailand, China, Indonesia and Malaysia, as she told Food Network during an interview. After 8 years of experience in heading the teams at Vermillion in Chicago and New York, she ventured out as a business woman with entrepreneurial foray into the hospitality industry. She founded Indie Culinaire. Chauhan Alle and Masala House in Nashville, Tennessee is her own restaurant which accommodates 150 guests at a time. The distinction of being the only Indian female contestant in Iron Chef and The Next Iron Chef brought her the opportunity to teach the global audience how to cook Indian food on ABC’s The View. On top of that, she was designated as the leading chef for the high and mighty at Indiaspora’s Inaugural Ball in honor of Barack Obama’s re-election as US President. With her first cookbook titled Flavors of My World: A Culinary Tour through 25 Countries, Chef Maneet Chauhan debuted as a published author. She was awarded by the International Association of Culinary Professionals for her second book, The Journey. Her repertoire also includes a signature spice line which is available at more than 3000 stores across North America. A distinguished ambassador of the Culinary Institute of America, she imparts lessons on her years of experience in hospitality and culinary arts to high school students and fresh graduates. At the same time, she volunteers for leading non-profit foundations and culinary schools.